Wash toor dal and soak in cold water for 30 minutes. Soak tamarind in 1 c water for at least 30 minutes. 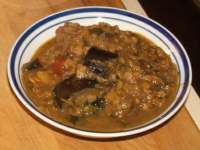 In large pot, cover dal with water. Add chopped potato. Bring to a boil and simmer til dal is very soft. DO NOT ADD SALT until dal is soft. When dal is the consistancy you like, season with salt or chicken stock powder. While dal is cooking, peel and chop ginger, garlic cloves, onion and eggplant. (Original recipe called for red pumpkin as well), Heat the oil in a large pan (we use a wok) and fry chopped ginger, onions, garlic, sambar masala, dhansak masala, turmeric, cumin, coriander and chili powders, coriander leaves, mint leaves, fenugreek leaves, tomatoes, eggplant and green chillies. Fry for 2 minutes, stirring continuously. Add chicken and saute for 2 minutes. Season with salt (or chicken stock powder) and stir well. Add the chicken to the dal mixture. Add brown sugar. Simmer til the chicken is cooked through before adding the tamarind water and lime juice; adjust for salt, then simmer for a couple of minutes. It is now ready to serve. Finely chop onions, garlic and ginger. In a large casserole pot that has a tight fitting lid, fry dried red chilies in oil until blackened then add onions, garlic and ginger and continue frying until they begin turning brown on the edges. Add ground spices (Here is a garam masala recipe) and fry for 2 minutes then add meat and fry until meat is turning brown. Add salt, black pepper, water, almond powder and yoghurt. Simmer over low heat for 1½ hours or until meat is really tender. Stir in butter for added richness. Add some sugar if you think the curry would benefit from some sweetness. (Lots of Indian cooks use a little in their curries.) Taste and correct seasoning as you like. It should be rich and big tasting. Add to the top of the rice 5 whole green cardamom pods, 2 good sized cinnamon sticks, 5 whole cloves. ***IMPORTANT NOTE*** If the rice in the fully cooked dish seems as though it's still too hard, dry, or not cooked enough: pour some boiling hot water over the biriyani - cover and cook 10 minutes more in the oven. The added water will cook the rice further. Garnish with fresh coriander leaves (cilantro), chopped green chilies and quartered hard boiled eggs if you like. Serve with lentils, steamed green vegetable and beer. Cut chicken into 8 pieces. In a large frying pan, without any fat or oil, toast red chillies, cloves, cinnamon over low heat for 10 minutes, stirring all the time. In the last 30 seconds add dry coconut. Turn off the heat and leave to cool. In a food processor, grind the mixture with ¾ c water to a fine consistency. Set aside in small bowl. Grind 1 c cashews dry then add water to make a paste. Set aside in another small bowl. Grind onions, garlic, ginger with a little water into paste. Put oil into the pan and heat. Add powdered cumin and coriander seeds for a second then pureed onion and garlic. Fry 10 minutes. Add the spice/coconut mix. Fry 5 minutes or so. Add chicken. Rub spices into chicken as you are dry frying for 10 minutes. Add cashew paste. Mix it around a little more. Add salt. Let cook 30 to 40 minutes or until done. Three minutes before serving, add the rest of the whole cashews to heat through. This is a thick, dark curry that has whole cashews in it. Serve with chapatis or naan and a green vegetable. ***IMPORTANT NOTE*** When grinding the spices and cashews, make sure that the pastes are smooth. If not, the curry will look curdled.